After I finished Neil Gaiman’s The Ocean at the End of the Lane (you can read my review of it here) I wanted to read something else by him too. I wanted to feel as engrossed in a book as I had done with that, and the other choices I had on my shelves weren’t really appealing to me at the time. I’ve had Coraline & Other Stories on my bookshelf since the summer but hadn’t got round to reading it, so the beginning of this year seemed the perfect time to finally pick it up. I’d never heard of Coraline until I watched the film version last year, which was brilliant, and it made me want to read the book. Coraline tells the story of a young girl who has moved into a new home with her parents. Exploring her new surroundings, Coraline steps into a different world, one which is home to a world that looks exactly like her own – only this one is occupied by her Other Mother and Father who’s only wish is for Coraline to stay with them. As Coraline uncovers the dangers of this unknown world, she has to use all of her courage and intelligence to return to her real home and parents. Once again, Neil Gaiman has weaved an extraordinary and fantastical tale that feels completely believable. Surreal and creepy, the story is written for children but can appeal to adults, too. Coraline is a great character: funny, brave, intelligent, courageous, curious, and determined, and following her adventure is captivating and compelling. Watching the film before reading the book (something I don’t normally like to do) didn’t detract from the book at all – in fact, I think the film has done an incredible job of bringing Gaiman’s vividly depicted world to life. While Coraline takes up a large portion of Coraline & Other Stories, the book is full of other gems that shouldn’t be discounted in favour of the more well-known Coraline. Taking myths, fairy tales, or nursery rhymes and transforming them into new and original modern tales, Neil Gaiman tells stories that, once again, are completely believable. The mixture of funny and scary stories work well in the collection and they all complement each other perfectly. All of the stories are quite short – none, I think, match the length of Coraline – but they often leave an impression that is difficult to shake. Whether it’s the sinister Jack in the Box, the detective solving the mystery of Humpty Dumpty’s death, or a stray black cat with mysterious injuries, each story is original and compelling. Interestingly, one of the characters in one of the short stories shares the same surname as characters in Gaiman’s The Ocean at the End of the Lane – I wonder if the character in this short story (The Witch’s Headstone) grew into Gaiman’s most recent novel? Or is it merely a coincidence? I’ve googled it to try and find out if there is a link but haven’t had much luck, so if you know anything about it, please let me know! Overall, Coraline & Other Stories is well worth reading. 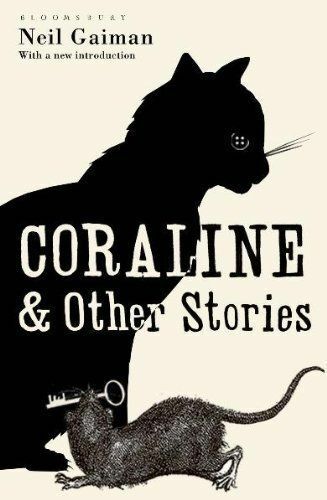 Coraline is the most well-known of this collection, and deservedly so, but the other short stories accompanying her definitely shouldn’t be forgotten. Creepy, memorable, original, and vividly created, Neil Gaiman has created a collection of stories that certainly leave a long-lasting impression. I don’t know if you’ve read other Neil Gaiman already (before your 2014 list) but whilst his big beasts of Neverwhere and American Gods are well worth a read (even though I have a soft spot for the former’s BBC TV series, whilst the latter I hear is being made now, I think) I would say that his Stardust is SO much better than the awful film that was made of it. A short tale, but well worth a read.